The shares of Russian companies, including a holding group that manages the assets of tycoon Oleg Deripaska, have plummeted by as much as 50 percent following last week’s round of U.S. sanctions. En+ Group, controlled by Deripaska, warned on Monday that the new round of anti-Russian sanctions would “highly likely” adversely affect its business and prospects. Leading global aluminium producer Rusal, also under Deripaska’s control, said in a statement on Friday that the sanctions could trigger technical defaults on some of its debts. The companies are two of 14 Russian entities and 24 individuals that were sanctioned by the U.S. Treasury Department late last week in response to “malign” activities. En+ Group and Rusal saw their shares cut in half on the Hong Kong stock exchange at closing time on Monday. The Moscow exchange said it imposed restrictions on trading En+ Group shares after they fell by 15 percent, while the U.K.’s financial regulator suspended trading En+ Group shares until the sanctions were lifted. Meanwhile, the ruble fell to a four-month low of 59.82 against the dollar and Russia’s two major stock indices were down to their lowest levels since last fall. Russian firms not under U.S. sanctions also took a hit in London, with steel miner Evraz and precious metals producer Polymetal down by as much as 15 percent. Kremlin spokesman Dmitry Peskov called the U.S. sanctions imposed on Friday “outrageous” and “illegal,” according to the Vedomosti business daily. 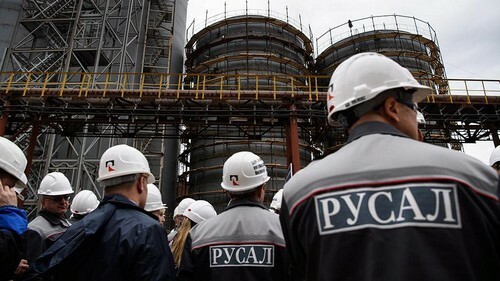 Prime Minister Dmitry Medvedev instructed his cabinet to devise measures to support the companies in addition to drafting retaliatory measures against the United States.